Welcome to the Academy for Population Health Innovation (APHI). 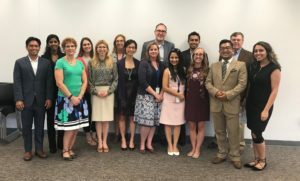 The Academy for Population Health Innovation (APHI) is a partnership between UNC Charlotte, College of Health and Human Services and Mecklenburg County Public Health. The overall mission is to improve the health of Mecklenburg County residents by working together to address health needs and priorities. Bring together the university, county public health, and the community to make Charlotte the healthiest place to live by collaboratively addressing our community’s most pressing public health priorities with evidence-based practices. APHI Team at the Annual APHI Nexus, April 2018… ..